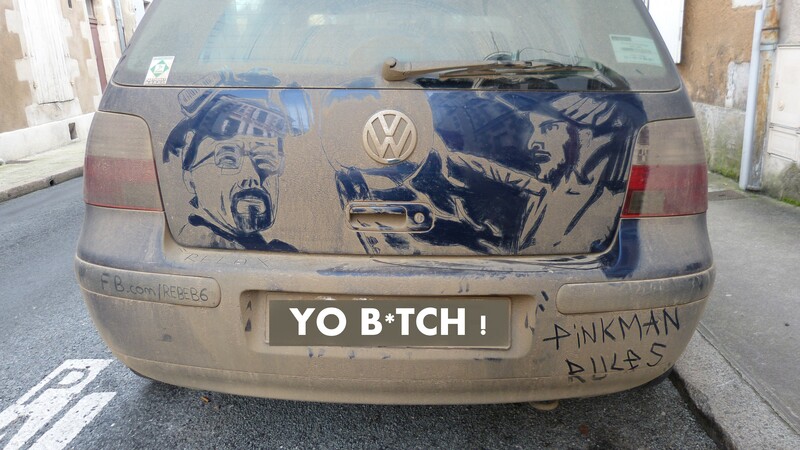 Oh my Heisenberg! This episode was kind of a filler, but is definitely digging up some interesting questions for the rest of the season. We find out what happens after the big confrontation between Walt and Hank which explores the effect that this secret has on their family. Also, you get to see what Lydia resorts to in order to correct the lazy production numbers. Oh and what about the world’s most miserable millionaire, Jesse? Hit the jump for a full Breaking Bad Season 5 Episode 10 Recap! Oh Jesse, what is going on with you? You leave Albuquerque millions of dollars on their streets, but don’t have enough sense to leave the scene. An old man, presumably out to go to work?, finds the first bundle of bills and then follows the trail to Jesse’s car. Jesse is on the spin-y-go-round, just staring at the sky. Not a care in the world. We begin outside of Hank’s garage just after the confrontation and Walt begins his frantic attempt to touch base with Skylar to warn her. Unfortunately, his brother-in-law has already gotten in touch with her and arranges a meeting. They meet at a local diner and Hank explains that he knows and should have seen the signs earlier. I/e: Skylar’s pool incident and her sending the kids to live with him and Marie. Skylar is quiet through most of his rambling. He tells Skylar that she and her kids will move into Hank’s home and that with Skylar’s testimony they will put Walt behind bars. He even blurts out that Walt’s cancer is back without any thought to how Skylar would react. Hank is so shaken by his discovery that it hasn’t even occurred to him that Skylar would be a willing participant in Walt’s double life. Before Skylar has had a chance to process her husband’s relapse and her potential new living situation, Hank whips out a digital recorder and asks her to start at the beginning. Skylar tries to ask for a lawyer, but her DEA brother-in-law says it is unnecessary which sets off more red flags for her. She freaks out demanding to know if she is under arrest and practically flies back home, leaving Hank staring at a Skylar shaped cloud of dust. Saul sends two of his lackeys to empty out Walt’s storage locker, but when confronted with the gigantic pile of money the two men give in to their Duck Tales fantasies and lay on top of the stacked bills. Can you blame them? I mean, when will you ever get the chance to do that? It was never one of my fantasies …until tonight. They arrive back at Saul’s office with a nondescript white van and barrels full of money. Walt fills a duffel to pay the three men and leaves a huge retainer for his future legal fees. Cuz we all know he is gonna need it! 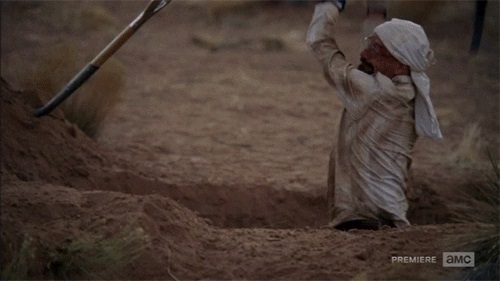 Walt takes the van and drives to the desert with a shovel and a pickaxe and begins to dig dig dig in a classic breaking bad montage. Across town, Skylar has returned home and is desperately trying to get in touch with Walt. Her search is interrupted when Marie begins to knock on the door. She is not giving up, so Skylar lets her in and they have a heart to heart. Skylar remains silent as she did with Hank and Marie just guesses the answers from Skylar’s broken expressions. The most important questions was ,”Did you know before Hank was shot?” Skylar answered with an apology and Marie rewarded her with a slap across the face. Marie freaks out and attempts to take Skylar’s daughter, but Hank intervenes and returns the baby to her mother. What about the Meth Empire you ask? Well, Lydia is responsible for the Czech connection now and the sub-par clarity is really hurting the profit margin. $50 million dollars, damn! She makes a special visit to a dusty junk yard in the middle of nowhere and inspects the nasty underground lab. This place seems just as small as the RV which started it all. The main difference is that this lab is dirty and managed by someone who is satisfied with 68%. During the tour we receive word that there is a problem and Lydia is left alone in the lab while they check above ground. She crouches down in anticipation, and you hear the faint pops and rattles of automatic gun fire. A minute later a familiar voice calls down to Lydia, It’s Todd. Lydia climbs the ladder, but stops and tell him that she doesn’t want to see. He guides her through the field of dead bodies. This basically means that the lab is moving yet again and Todd will be the head cook. His family will be running security . Back in the desert, Walt finishes burying his barrels of money and camouflages the area. He memorizes the coordinates and destroys anything that could lead anyone to it. He then uses those numbers as his lottery numbers and sticks the ticket on the fridge. Skylar hears a noise in the kitchen and finds her husband, covered in dirt and some blood from his fight with Hank. He passes her and she hurriedly tells him she said nothing. He strips down to his signature tighty-whiteys before passing out. Skylar realizes that Hank was telling the truth and Walt’s cancer is back. When he comes to she tells him that Hank doesn’t have evidence yet and that she thinks they should remain quiet. At Hank’s place, he has been up all night trying to put together some evidence against Walt. Marie convinces him to tell his boss sooner than later in the even that Walt is caught and Hank is implicated by omission. He finally goes back to work and calls for a phone conference with his boss. He finds out that Jesse Pinkman is in custody and that he was caught throwing millions of dollars around New Mexico. He immediately goes to the interrogation room. Jesse is inside the room, but he seems like he is still in his own world despite the taunting detectives. Hank convinces them to take a break and leave him alone with Jesse. Okay, I need next Sunday to get here ASAP. 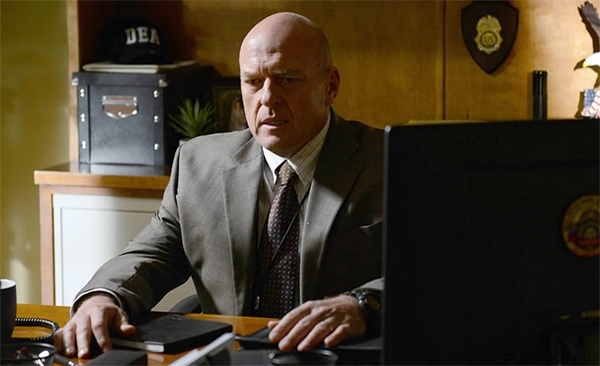 Jesse’s guilt could force him to confess or give up Walt. I have to know what Hank will say to get Jesse to talk. Or is Walt still so intimidating to Jesse that he will stay quiet? Let me know your predictions in the comments.